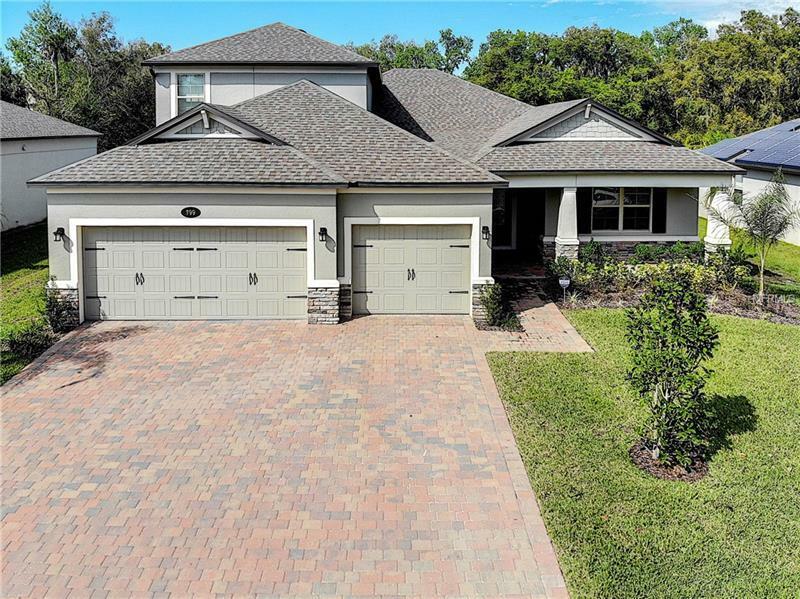 This is a remarkable 5 bedroom, 4 bath, 3-car garage home. The exterior stone accent and covered front porch on a cul-de- sac lends to its amazing curb appeal. Once inside, you will love the openness of this true split and open floor plan. In addition to having 5 bedrooms, this stunning home also has a study/living area. The Formal Dining area is framed out elegantly with stately architecture within the open concept floor plan and is conveniently close to the kitchen and family room. The kitchen never leaves the cook out of what is going on in the home. It features an oversized island, banks of 42" cabinetry for storage, a pantry, and overlooks a large breakfast nook, family room, and lanai. The large family room features triple 8 ft. sliding glass doors and panoramic views of the open concept kitchen and backyard. Two secondary bedrooms can be accessed through a hallway and share a bath with its own linen closet. The fourth bedroom and pool bath are at the rear of the home and is perfect for guests or family members wanting their own private space. The Master Suite offers the homeowners access to the lanai from sliding glass doors. The Master Bath features granite dual sink vanity, and features a separate tub and shower or you can opt for the deluxe master bathroom layout, adding more closet space and an oversized walk-in shower. Upstairs offers an amazing bonus room and 5th bedroom! This home is also Energy Star 3.1 Certified. Call for your personal tour of the home today!